This entry was posted on November 1, 2014 by admin. 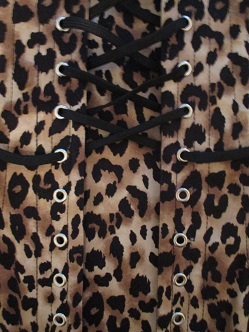 For those of us who prefer to wear our corsets as an undergarment, this post is a quick how-to on concealing your laces so as to avoid that pesky "lump" they can sometimes cause at center back. Though tempting, this is generally a bad idea. Yes, technically a knot would cause less of a lump at the back, but that doesn't outweigh the fact that it can prevent you from getting out of your corset easily and comfortably, even if you were to have someone assist you. Knots can be very difficult to undo. 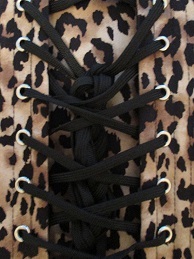 Though this does seem like the most logical idea when it comes to reducing the length of the laces and as a result, reducing the back bulk, what this will eventually do is cause wear to the fabric of the corset from the friction of the laces. Bad idea. 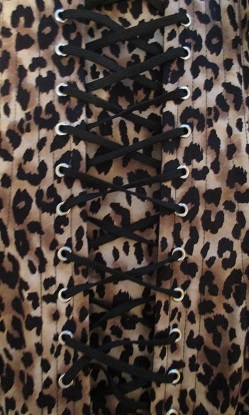 Even though we're talking about laces as an undergarment here, we still don't want to compromise the beauty of the corset, am I right? And now for the "Do's"
For this method, you will need to leave a gap of 2" at the back, to make it easier to pass the laces through the x's (don't worry! there are images below to give you a visual about what I'm going on about here!). To do this, undo the knot at the bottom of the corset and unlace it to just above the bunny ears. 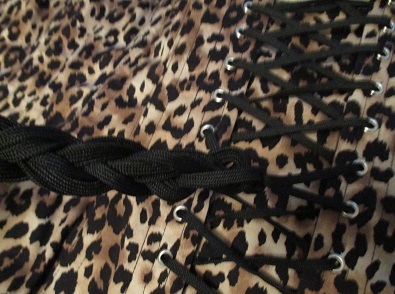 This way, you will now have the corset tying up at the bottom and the excess can either be tucked in under the bottom hem of the corset, or easily hidden under a pretty A-line skirt. And there you have it: several tips on how to avoid the back bulge!